As I can tell from the recent pictures I published on tastespotting, Christmas spirit in truly taken over the food-blogosphere! I couldn't get enough of all your wonderful cookie pictures, and published a dozen in the past hour alone. Well, I am in the Christmas spirit too, and have a list of cookies and treats I want to make for the celebration. I'm sure you all agree that the holidays can however also be a little over-bearing. Sometimes, as a counterpart to all the craziness, I need a simple salad to get me through. This does it every time. Although, this salad is wonderful on a warm summer day, I also find it deliciously refreshing when you want something light but still satisfying in the winter. So here goes! I also love this salad because the acidity of the grapefruit helps to keep the avocado nice and green (as does the lemon in the dressing) so it's easy to make in advance for entertaining. However, if after a light meal you still want a treat, chocolate truffles, lemon ricotta cookies or panettone and chocolate bread pudding should surely do, right? 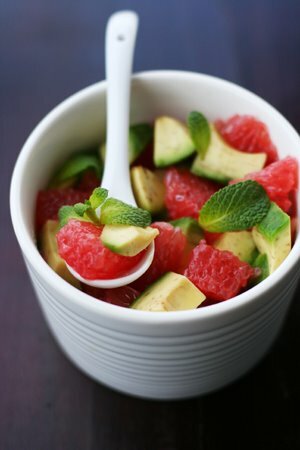 Mix the grapefruit and avocado in a bowl. In a separate bowl, whisk the olive oil and lemon. Taste the vinaigrette and season with salt and pepper. Spoon over the salad and garnish with fresh mint. Enjoy! This salad looks and sounds perfectly refreshing! This looks sooo good and refreshing - I bet it was quite tasty! Oooh, this looks so refreshing and deliciuos. Clean and simple. This is exactly the kind of salad that I like to make with Mexican food or other spicy things. The contrast is awesome. And I totally hear you with needing something healthy with all of the indulgence! looks amazing! how much lemon juice do you put in the dressing? A beautiful salad...exceeds the title in looks and great for this time of year. I would have never thought to combine these ingredients, but it sounds like a wonderful, refreshing salad! This is a great combination of ingredients. I love all three and would really enjoy this salad! Refreshing & gorgeous...very very nice salad. I love the colours & flavours marrying so beautifully in there...have a great holiday season! Beautiful salad! It looks so refreshing -- and you're so right, it's a lovely break from all the holiday decadence! Yum—this is exactly what I'm craving. love the colours! This salad looks like summer... it brings me hope that through these snowy days summer is somewhere around the corner! I haven't visited in a while and I can see that I have clearly missed out on much! Mmmm... what an interesting flavor combination. I bet this tastes fantastic! I've never seen such a beautiful looking salad before. The combination of avocado and grapefruit is new to me.